For more loose-fitting full-body protective coveralls or boilersuits, see Boilersuit. For other uses, see Jumpsuit (disambiguation). A man wearing a jumpsuit. 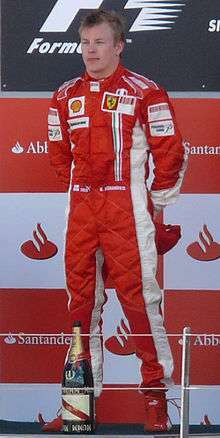 Formula One driver Kimi Räikkönen in a protective one-piece auto race suit. Singer Rihanna in a fashion jumpsuit in 2012. 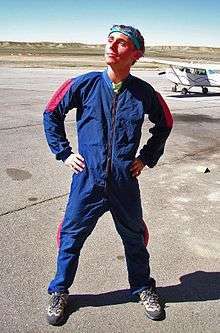 Jumpsuit is a piece of clothing, originally referred to the functional one-piece garments used by parachuters/skydivers. More recently, it has come to be used as a common term for any one-piece garment with sleeves and legs and typically, though not always, without integral coverings for feet, hands or head. The original skydivers' jumpsuits were simple garments designed to insulate the body from the cold of high altitudes and minimize risk of covering important handles and grips. Today, however, the garment has found other uses. Jumpsuits are generally regarded as a garment of convenience, as they are simpler to launder, put on and remove than an ensemble outfit. Unless the jumpsuit has a drop seat, however, it is necessary to remove it entirely for bathroom use. Aviators and astronauts sometimes wear insulated, fire-retardant jumpsuits or flight suits where other types of clothing can potentially float or flap about in zero gravity or during high-G maneuvers. Drivers in motor racing wear jumpsuits for protection against fire and (in the case of motorcycle racers) leather suits for abrasion. Skiers wear insulated jumpsuits or ski suits to protect themselves from cold (especially after falling or tumbling in snow). Competitive skiers and speed skaters wear skin-tight jumpsuits to provide freedom of movement while minimising air resistance. Skydivers wear technical jumpsuits as main sport equipment for today's sport skydiving. The jumpsuit's simple one-piece design also makes it a practical garment for tradesmen, such as cleaners, auto mechanics and plumbers, who often wear looser-fitting jumpsuits, or coveralls, where they need a better-protecting garment than an apron or bib. The jumpsuit has sometimes been mandated as an institutional uniform, as it can be a unisex garment and can accommodate a wide range of body shapes. Prisons in the United States and sometimes in Canada use bright orange jumpsuit uniforms for inmates for ease of identification and high visibility. Like other forms of distinctive prison uniforms, such clothing is easily distinguishable from that of civilians in the case of escape, thus aiding in escapees' identification and recapture. Issuing jumpsuits rather than pants also removes the need for belts, suspenders or drawstrings, items which are very often contraband due to their potential use as weapons or aides in self-harm or suicide. The widespread use in prisons of orange jumpsuits has led in these countries to a cultural association with imprisoned convicts, as is the case with the now less prevalent pattern of black and white horizontal stripes. University and polytechnic students in Finland and Sweden often wear jumpsuits colored according to their school or field of study at student parties, so called student boilersuits. A simple-to-launder one-piece garment can be especially convenient for parents to dress small children in. In countries with colder climates, snowsuits, or jumpsuits quilted or padded for warmth, are popular during the wintertime. Jumpsuits have also reappeared from time to time in high fashion, where it is often attractive to designers because it has an unbroken line running from the neck to the feet and can be flattering on some body shapes. The word onesie is used to describe casual jumpsuits (to be used as loungewear or pyjamas) which became a fashion fad around 2010, but the word is sometimes also used for other forms of jumpsuits, like one-piece motorcycle suits or skisuits. Starting in the 1960s, the jumpsuit has made occasional appearances in common and high fashion (particularly in the 1980s). They retain connotations of the future because they have been frequently featured in popular science fiction. Jumpsuits have often been used as stage costumes in stage productions and by various singers and bands. 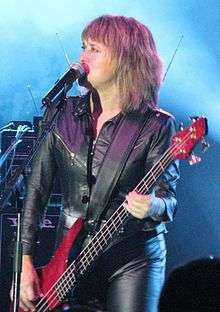 A black leather jumpsuit is part of Suzi Quatro's image. Elvis Presley, Mick Jagger, The Who, Queen, Feeder, Alphaville, Goldfrapp, Aaliyah, Britney Spears, Pink, Devo, Polysics, Spice Girls, Korn and Slipknot, for example, have all performed in flamboyantly-designed jumpsuit-like garments. Catsuits, or skin-tight jumpsuits of shiny fabric, have also been popular on stage. On the TV series, Scrubs, the character Janitor is frequently called "jumpsuit" or referred to as wearing a jumpsuit, although he frequently corrects the speaker by pointing out that he is wearing a shirt and pants, commenting, "who wears a belt with a jumpsuit?" On the original 1987 Teenage Mutant Ninja Turtles cartoon series, the news TV reporter April O'Neil is well known for always wearing a yellow jumpsuit. In the episode "Looks and Books" of the 1999–2000 TV series Freaks and Geeks, one of the main characters, Sam Weir, gets talked into buying a baby blue jumpsuit by a smooth talking shop owner, played by Joel Hodgson. The shop owner promises Sam that this "Parisian nightsuit" will make him look like a "man of distinction" and effectively a "superstud". David Sugalski, also known as The Polish Ambassador, is an electronic music artist that makes use of a vintage neon-yellow Swiss jumpsuit during his live shows. In the Portal video game series, the playable protagonist, Chell, wears a distinctive orange jumpsuit, which also led to jokes made inside the game by other characters. In the British TV Series, Misfits, all of the ASBO characters wear orange jumpsuits. Curtis notably wears his tied off at the waist. In the Fallout video game series, humans who live in the vault series of fallout shelters wear blue and yellow jumpsuits with the number of the particular vault on the back and the neck. ↑ Bonsor, Kevin; Nice, Karim. "NASCAR Fire Suits". HowStuffWorks. Retrieved 2007-12-30. ↑ Mahr, Krista (2007-04-29). "Finns Gone Wild: One Day Each Spring, Dignity Takes a Back Seat to Bubbly". Washington Post. Retrieved 2008-03-13. 1 2 Watson, Linda (2004). 20th Century Fashion: 100 Years of Style by Decade and Designer, in Association with Vogue. Firefly Books. ISBN 1-55297-988-1.